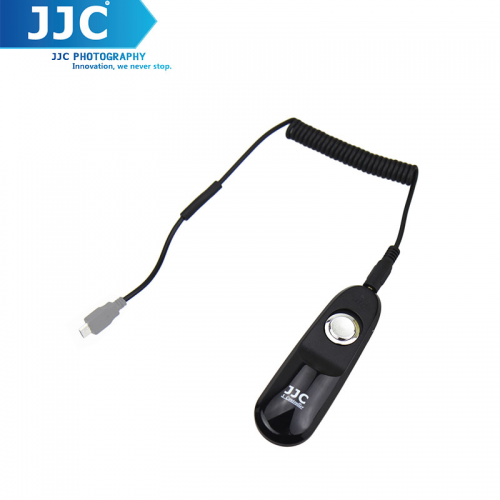 The compact Canon Remote Switch with a 2.6'/80cm cable is a remote shutter release which is designed to prevent camera shake for super telephoto shots, macro photography and bulb exposures. Handy for taking pictures of subjects that are difficult to approach, or to minimize vibration for close-ups and time exposure. The Remote Switch works just like a shutter button, enabling halfway or complete pressing. It also has a shutter-release lock. With the EOS-3's Custom Function No. 12 (mirror lockup), camera shake can be further reduced. Compatible with EOS-3, 1v HS/1v, 1D-series, 1Ds-series, 5D-series, 6D-series 7D, D30, 60D , 70D , 6D , D60, 10D, 20D, 30D, 40D and 50D. Note! Only compatible in still mode. Will not trigger the camera in video mode. The JJC S series Remote Switch is a compact wired remote switch with a cable which replicates all functions of the camera's shutter release button. Handy for taking pictures of subjects that are difficult to approach, or to minimize vibration for close-ups and time exposure.